I had to see for myself, so I read the executive order. The order does seek "to protect the American people from terrorist attacks by foreign nationals admitted to the United States." It says that it seeks “Suspension of Issuance of Visas and Other Immigration Benefits to Nationals of Countries of Particular Concern." It also says "I hereby proclaim that the immigrant and nonimmigrant entry into the United States of aliens from countries referred to in section 217(a)(12) of the INA, 8 U.S.C. 1187(a)(12), would be detrimental to the interests of the United States, and I hereby suspend entry into the United States, as immigrants and nonimmigrants, of such persons for 90 days from the date of this order." And it targets Syrians specifically. "I hereby proclaim that the entry of nationals of Syria as refugees is detrimental to the interests of the United States and thus suspend any such entry until such time as I have determined that sufficient changes have been made to the USRAP to ensure that admission of Syrian refugees is consistent with the national interest." Go back and read it again. Do a “ctrl-f” to find “Iraq”. Where is “Iraq” in the order. It’s not there. Only Syria is there. So where are the seven nations? 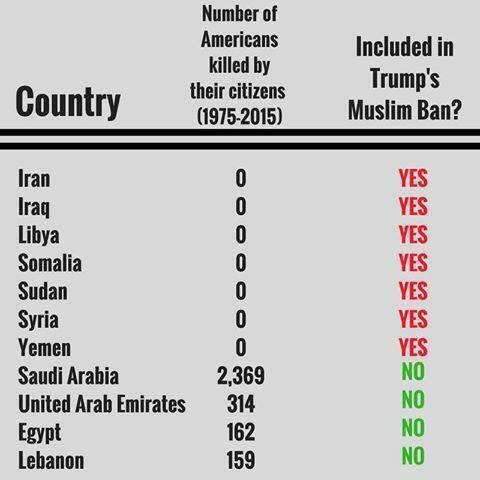 Where is the “Muslim ban”? It turns out this was a form of fake news, or alternative facts. Trump didn’t select seven "Muslim-majority" countries. US President Barack Obama’s administration selected these seven Muslim-majority countries. "It is not uncommon in executive orders or statutes to use these kinds of cryptic cross-references to other statutory provisions in identifying the nations subject to certain requirements. But this way of referring to the seven targeted countries, all predominantly Muslim, seems of a piece with the Trump team’s effort over the past several months to downplay the fact that travel bans are addressed to concerns about Muslims. Section 217(a)(12), passed in 2015 after the San Bernardino shootings, imposes additional restrictions on travel to the US by persons who have traveled to regions of the world with significant terrorist presence. The statute specifically names Iraq and Syria and provides a process whereby further countries can be added. At present, five others are also on the list: Iran, Libya, Somalia, Sudan, and Yemen." "The order is a priceless recruiting tool for ISIS and similar movements, because it so easily fits their narrative that the United States is the enemy of all Muslims. And it will discourage tips and information from American Muslim communities — information that in the past has proved highly valuable to the thwarting of terrorist acts. Accordingly, the Bush and Obama administrations both strived to avoid all measures that could be painted as broadly anti-Muslim. Much of that vital engagement with Muslim communities has been gravely undone by this order." Vox is a news source? .. . . "But this way of referring to the seven targeted countries, all predominantly Muslim, seems of a piece with the Trump team’s effort over the past several months to downplay the fact that travel bans are addressed to concerns about Muslims.. . . The statute specifically names Iraq and Syria and provides a process whereby further countries can be added. At present, five others are also on the list: Iran, Libya, Somalia, Sudan, and Yemen." Therefore, the 7 countries on the list were based on the statute, plus later findings by DHS, and not where Donald Trump has done business. "The order is a priceless recruiting tool for ISIS and similar movements, because it so easily fits their narrative that the United States is the enemy of all Muslims.. . . "
How could this possibly be true? Islam is The Religion Of Peace™! Yet, if you do something they don't like, they turn into homicidal terrorists? > How could this possibly be true? Islam is The Religion Of Peace™! Sigh. How many times do I have to explain this to you? Just because most terrorists are Muslim does not mean that most Muslims are terrorists. But if you draw this false conclusion (and Trump has) and worse, turn it into policy (and Trump has) *that* gives the minority of Muslims who are terrorists a valuable recruiting tool. Treating someone as if they were a terrorist can easily turn into a self-fulfilling prophecy. >Sigh. How many times do I have to explain this to you? Just because most terrorists are Muslim does not mean that most Muslims are terrorists. >But if you draw this false conclusion (and Trump has) and worse, turn it into policy (and Trump has) *that* gives the minority of Muslims who are terrorists a valuable recruiting tool. Treating someone as if they were a terrorist can easily turn into a self-fulfilling prophecy. But it's The Religion Of Peace™! What about love thy neighbor and turn the other cheek?